Staying in the Smoky Mountains on vacation should be on everyones list. But its deciding on where to stay is much harder. Sevierville, TN hotels offer convenient locations near outlet shopping, Smokies baseball park, and other area attractions. Sevierville is the first stop in from interstate 40. One advantage to staying in Sevierville is a shorter drive to your lodging when arriving and quicker access to I-40 when you are ready to leave. It can take hours to reach Pigeon Forge and Gatlinburg during peak times on Friday and just as long to leave on Sundays. During your stay, traffic going into and coming out of Pigeon Forge should be much lighter. As one of the few Three Diamond AAA rated hotels near Dollywood, the Resort at Governor's Crossing impresses at every turn. Nine-hole mini-golf, a substantial water park, zero-entry pool, lazy river and other fun on-site attractions are just the start. Spacious studio and multi-room units boast fully equipped kitchens, washers/dryers, jetted tubs, gas fireplaces, DVD players and more. Book now to enjoy the stunning mountain views and exceptionally appointed rooms. 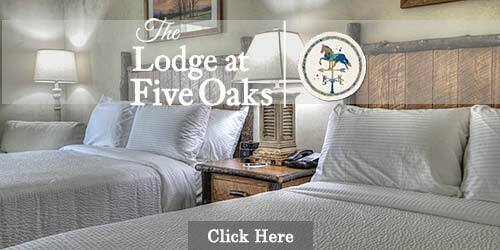 The Lodge at Five Oaks is an upscale hotel located in Sevierville, Tennessee. It features rustic furniture, hard wood floors and other amenites that remind you of life on the farm. 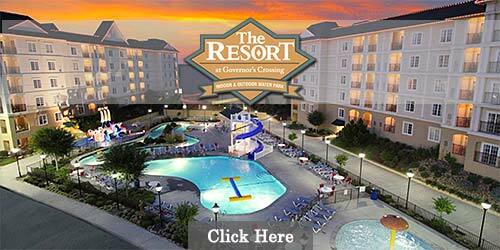 Come and enjoy the mountains from this Sevierville hotel near Tanger at Five Oaks.